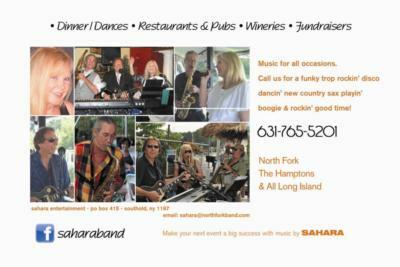 From the Wine Country of Long Island, New York, we bring the party to you. An extremely versatile ensemble for any occasion. We are available to travel anywhere in the USA and the Caribbean, depending on our calendar. Trio consists of saxophones, flute, percussion, 2 vocalists, keyboard and guitar with each member playing several. We are accompanied by refined, background rhythm tracks. We have lots of dance music from the 1940s to present as well as country/western, jazz, rock and special requests with advanced notice. 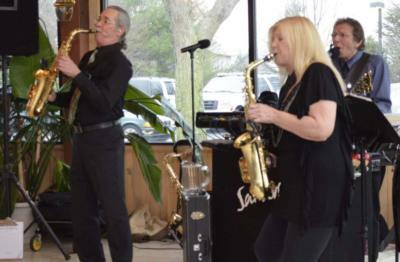 Voted as number one band of the North Fork by Dan's Papers readers in 2011, we perform at the wineries, dance halls, American Legion, KoC, hotels, back yard parties, catering halls and even a beer joint or two. Please note Sahara will also travel to Holbrook, Oakdale, Sayville, West Sayville, Bayport, Great River, Islip Terrace, Ronkonkoma, Blue Point, Central Islip, East Islip, Hauppauge, Holtsville, Islip, Lake Grove, Nesconset, Farmingville, Patchogue, Bay Shore, Brentwood.